The term Accurising (often spelt Accurizing), isn’t a true word, nor would it be spelt with a z! But if it did exist, it is a fair description of what we are doing. Whichever term we use however, the process is the same, we are looking to eliminate all the miss-alignment which occurred in the production manufacturing processes. 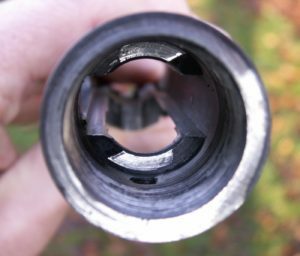 In our example below, we are correcting a Remington 700 short action, as it happens the chambering will also be changed from 22-250 Remington, to 0.308 Remington with a new target barrel – although we are only showing some of those aspects associated with truing the action here. Of course the Remington 700 action is only one example, we follow the same process – with slightly different tooling – for SAKO, TIKKA, Ruger, Savage etc. etc. Here we have the donor action, as stated this was a 22-250 and was already available from the customer. The first aspect is to strip it down – completely! Don’t forget you may click on the picture for a larger version. Here we are partially stripped down for inspection, we recommend you click on the picture for a larger version as there are some details worth noting! The first thing to note is the condition of the thread, as can be seen it is fairly “scrappy” since it is both corroded, and roughly cut. 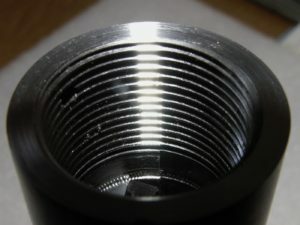 The second point in this view is the condition of the Lug – note that there actually isn’t a clean surface all around, and in fact has some rust in one area – basically the Barrel-Lug-Action joint is misaligned. 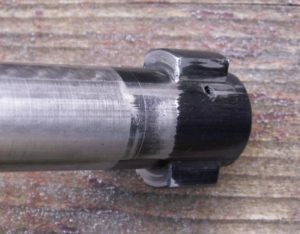 Now, looking at the bolt end we can see some gouging on the bolt face, this bolt will therefore need truing as well (Usually the case), and although we won’t show it here this will follow the same process as the action – with quite different tooling! Now looking at the bolt from the other direction, we can see a more serious issue, both lugs are quite gouged – so there is no doubt we will have to re-machine this bolt! In addition we would expect the action itself to show the same gouging! …And guess what, you can see the damage on both lugs! The new thing to note is the ring at the end of the action, it is shiny from 2’o-clock through 8’o-clock – showing where the Barrel-Lug-Action joint is tight, whereas from 8’o-clock through 2’o-clock it is dull where there was a gap. 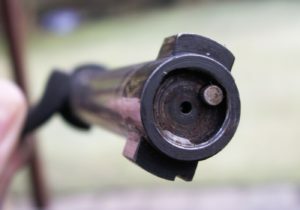 When this gun fired, the pressure in the chamber pushing the case onto the bolt face (and thus trying to split the Barrel-Lug-Action joint open) would cause uneven forces on one side to the other – basically this joint would cause the rifle to bend at the joint causing inaccuracy. 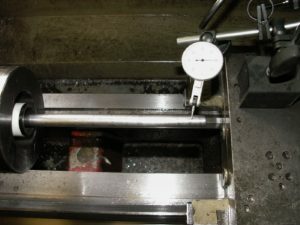 The key thing for machining this action, is setting it up accurately on the lathe (the machine we use to machine the action true), the first set of tooling is an alignment rod and bushings. 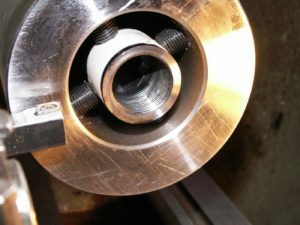 Each of the bushing pairs are manufactured in 0.0001″ increments and one must select the two which fit the raceway (where the bolt runs) – one at each end. Now we must fit the bushing into the action, then insert the rod. Once we have it looks like this! Now we can mount the action in the lathe – using a special chuck which allows us to move each end of the action in all planes. 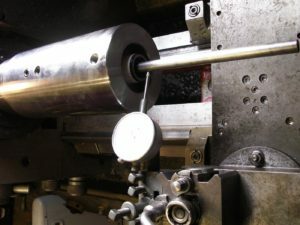 Once in the chuck, we can start to ensure the rod is completely running true to the lathe centres. 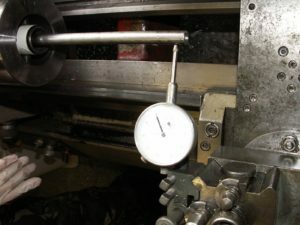 Firstly we adjust one end such that when the chuck rotates we have a maximum of 0.001″ movement on the Dial Test Indicator (the DTI is the round instrument with the needle). 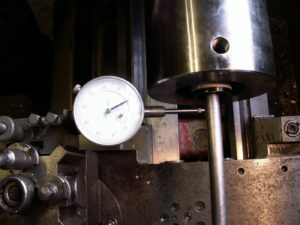 Before moving the DTI to the other end, again we must limit the movement to a maximum of 0.001″, both as we move the DTI along – and at the far end when we rotate the lathe. Now that sounds simple! – But I can assure you it isn’t, as this is by far the longest part of the process. Each time one end is slightly tweaked – the other end needs redoing – and it goes on for ever!!!! However, eventually we get there – a maximum of 0.001″ runout at each end, and along the length as we rotate it. So now we have the action running true to the raceway as accurately as we can measure. Time to slip out the Rod and Bushing. Again open the picture by clicking on the image to the right, as we can now see more detail on the misalignment we saw earlier – we have taken a small cut, and you can see only one side of the action has actually been cut! If we had any doubt before that the action face wasn’t cut true and accurate to the action raceway – it is clear now! 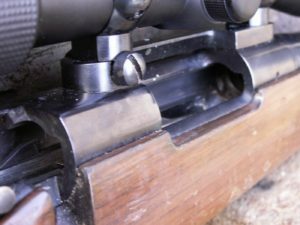 On many rifles, such as this Remington, this face is the PRIMARY face for the Barrel-Action joint, and therefore the most critical! Now we have completed the primary face – a clean fresh cut completely around the surface, we can then cut the internal lugs (similar to the primary face) and then pick up on the thread. In all cases when cutting the thread, it always picks up on one-side more than the other – showing that the original thread wasn’t actually truly in line with the raceway and the bolt! 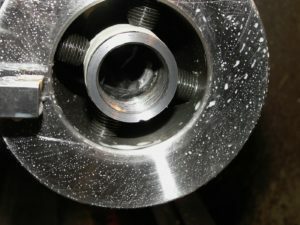 Now we have the completed action cleaned up, – note all the bearing surfaces – the primary face, the lugs and the thread itself have all been machined in the one set-up accurately and true in line with the bolt raceway. We can move onto the Bolt itself, and using tooling specially designed for machining the bolt exactly true to the bolt axis we can machine the bolt face (where the head of the cartridge sits) and the two locking lugs, so again everything is true and accurate to the bolt axis. So here we have the bolt in the action, and you should be able to make out all the clean surfaces (except for the bolt lugs which are in contact with the action lugs). 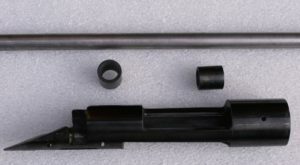 This is now ready for a deep clean, clear out all the other threads, and we can machine the tenon on the blank barrel, thread it for a good fit to the action, fit a new barrel lug and chamber the barrel, then fit a 20moa steel rail and fully rebuild/test the rifle with new springs, trigger group and extractor etc. 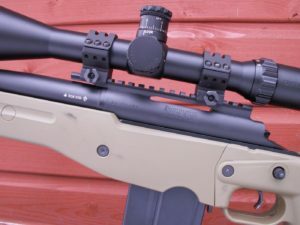 In this case the whole rifle was Cerakoted in black, and fitted to an Accuracy International Stock. Here is a picture of the finished rifle, this was a typical re-build, which retained the same Remington extractor system etc. 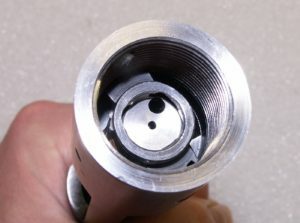 There are of course as many options as one can imagine – different firing pins (thicker for reduced primer-flow), SAKO or M16 style extractors and so on. Dream of it, we can make it a reality!